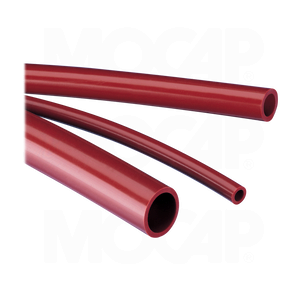 MOCAP Silicone Rubber Tubing is extruded from a specially formulated silicone with a hardness rating of 60 Shore A and heat stabilized to ensure re-use at temperatures up to 260°C (500°F). MOCAP Silicone Rubber Tubing is non-staining and is commonly used for masking studs, pins and other round objects that require a longer length than our standard length silicone caps. Silicone rubber tubing is stocked in 25m coils and can be factory cut to length. Ask about custom diameters, sizes and profiles for your specific application. MOCAP manufactures a full line of masking products including many types and sizes of masking caps and plugs available in silicone rubber, EPDM rubber and high temperature vinyl. Also available: polyester tape, polyimide tape, polyester discs and polyimide discs. Many Sizes of Our Silicone Rubber Tubing are Stocked for Immediate Shipment.